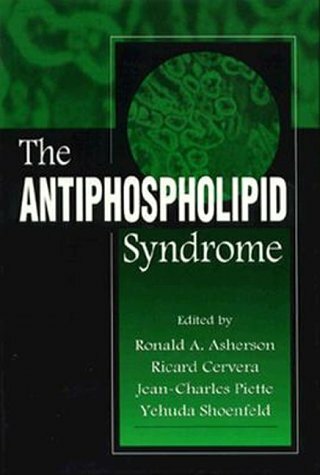 Written by the foremost researchers in the field, this book gathers together in a single source the many important clinical associations of antiphospholipid antibodies. Antibody-related clotting mechanisms and their relationship to conditions such as recurrent strokes, chorea, multi infarct dementias, a variety of spinal syndromes, Addison's Disease, recurrent miscarriages, and many more are discussed in depth. The importance of these antibodies in 'Primary,' 'Secondary,' and 'Catastrophic' Antiphospholipid Syndrome is highlighted. Each chapter is devoted to a specific internal system and the clinical effects this syndrome has on that system.<br />This authoritative book is an essential addition to medical libraries as well as an invaluable reference for general physicians, internists, rheumatologists, neurologists, cardiologists, nephrologists, endocrinologists, gastroenterologists, pulmonologists, dermatologists, and obstetricians. Your orders usually will be processed within 2 business days and ship out from multiple locations including Malaysia. It takes only 2-4 business days to deliver within USA, UK, France, Germany, Australia and Asian Countries. If your book is heavy or oversized, we may contact you to let you know extra shipping is required. We do NOT ship to PO BOX, APO, FPO addresses. Daytime phone number is required to avoid delivery delay.